The Petaluma Airport has been something of a salvation to my family in the early years of my son’s life. Going out to eat was impossible until we discovered the Two Niner Diner and its patio view of the airport runway. Our spirited baby became momentarily engrossed in watching the planes take off and we actually got to consume an entire meal at a pace that allowed us to chew before swallowing. Since then we’ve been regulars at the diner and frequently hangout on the “tower” deck to do some plane spotting. 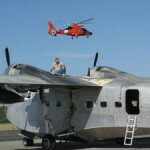 There is almost always some entertaining activity at the Petaluma Airport. If the sky is clear the runway can get pretty busy. There are a couple of resident biplanes that make regular appearances and one afternoon we caught three Russian Yaks flying in formation. 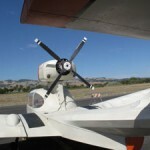 The aircraft range from ultra lights and gliders to military and small jet planes. Random planes stop to visit Petaluma on a daily basis so you never know what to expect. 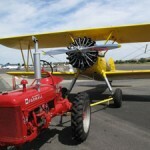 Last year was the 1st Annual Wing & Wheels organized by the Petaluma Area Pilots Association (PAPA). The event attracted a good crowd with a wide assortment of planes and cars on display. The histories of the planes fascinate me. 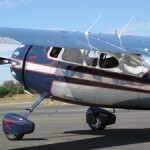 The owners will enthusiastically share with you the tales of their plane’s past. There were old military trainers, classic biplanes, and planes with unusual designs; each with its own unique contribution to aviation history. There aren’t many of these beautiful old machines left these days so I’m grateful for the passion the owners have in keeping, restoring and maintaining them for posterity. Last year, as Wing & Wheels was drawing to close, we were treated to an unexpected visit by an old Albatross, a large twin-engine amphibious flying boat. It is definitely one of the largest aircraft I’ve ever seen at the Petaluma airport. As it rotated around the force of the large propellers blew over a couple of the event booths. Everyone watched intently as men climbed to the top of the beefy aircraft to manually check the fuel level and gas up. 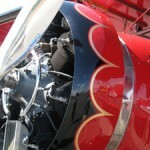 The 2nd Annual Wings and Wheels is coming up this Saturday, July 17th, from 10am to 4:30pm. 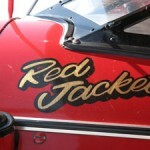 This year they promise more than sixty aircraft and 200 custom/classic cars, trucks, and motorcycles! 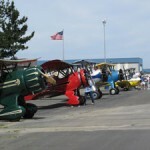 There is no better day to get out and visit the Petaluma Airport. The admission is $2 for adults; kids 16 and under are free. PAPA also organizes Display Days every third Saturday of the month from 10am to 3pm (except for August and December); another great opportunity to see some magnificent flying machines. So go grab some grub at the diner and stroll the tarmac. Or, come visit any old day and walk down the trail from the airport parking lot to Wiseman Park and watch the planes get ready to take off! The park commemorates the first US airmail flight by Fred Wiseman from Petaluma to Santa Rosa in 1911.